A few days ago, somebody tweeted an article on organelles and somebody else tweeted an article on how worms regenerate their bodies. I was just in a slump of Brexit malaise when I saw this and thought, “oh, there is life outside Brexit at least in worms and cells”. So, I started to read an article published in Nature by Elie Dolgin, a science journalist: “How secret conversations inside cells are transforming biology”. What’s discussed in this article is probably well-known to cell biologists, but it wasn’t to me. I was hooked, not only because of the science but also, and perhaps even more so, by the firework of metaphors that I encountered. This made me think again about the fact that science/communication without metaphor is basically impossible. This seems to be particularly the case for cell biology, as the recent book by Andrew Reynolds has shown, entitled: The Third Lens: Metaphor and the Creation of Modern Cell Biology. In the following I shall put the Nature article under metaphorical microscope and tease out various types of metaphors used in it: conventional metaphors, more creative metaphors, and finally an extended metaphor, telling a whole new story about organelles. I shall also say something about the interactions, indeed, ‘cross-talk’, between verbal and visual images, which was important for advancing research into organelles, leading up to discoveries relating to how organelles themselves talk between each other. The Oxford English Dictionary defines organelles as: “Any of various discrete, usually membrane-bound, structures within a cell or unicellular organism that perform specialized functions”. 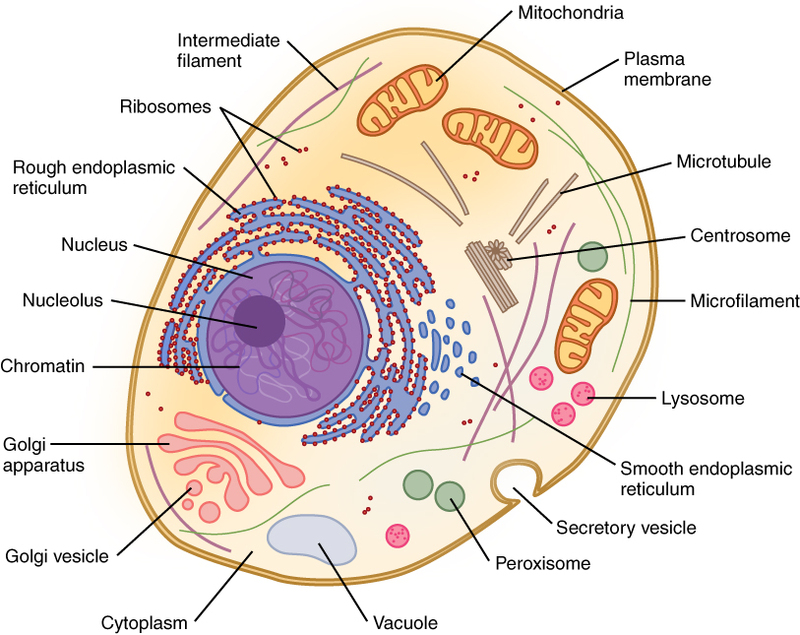 In biology textbooks the various organelles inside a cell are generally depicted and labelled in standard ways, as for example in the featured image for this blog post. 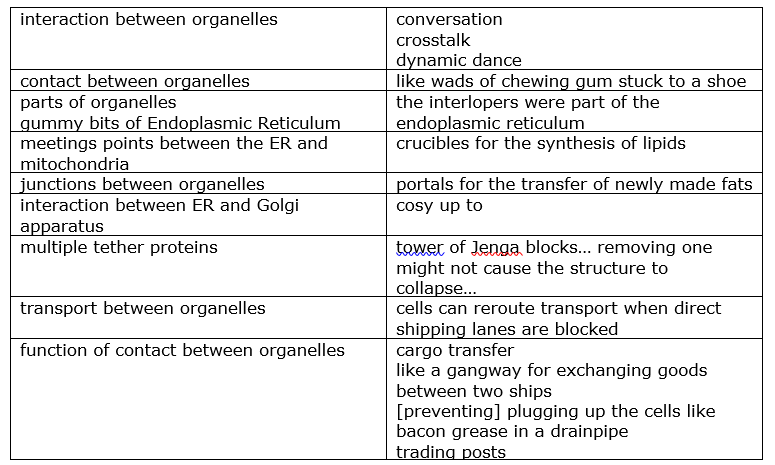 One can also often find tables, like this, that list organelles and their functions. And in the description of functions, metaphors creep in – in this case we are dealing with a eukaryotic cell. The metaphors in this table are quite tame: In other textbooks we find other metaphors and they circulate in science talk and text. When I tweeted about my intention to write this post, Matthew Cobb tweeted: “”powerhouse” (mt), “construction yard” (ER), “warehouse” (Golgi), “vacuum cleaners” (lysosomes), “dustbin” (vacuole), “frontier” (cell wall)”. Some of these metaphors are more conventional than others, I suppose. The most overused and clichéd one seems to be that of ‘powerhouse’ for mitochondrion. As Liam Drew pointed out in a tweet: “I wrote something like ‘mitochondria – the powerhouses of the cell as science writers are contractually obliged to describe them’ and my copy editor changed it to ‘mitochondria – the powerhouses of the cell’”. Back to the article under my microscope. The Nature article uses the conventional metaphor of ‘science as a journey’ through which we are told the story of Jean Vance who, after hitting a series or ‘roadblocks’ over a long period of time, finally published a ‘landmark’ paper which put organelle ‘conversations’ ‘on the map’ (that last one is my own metaphor). I won’t go into this rather fascinating story, but focus instead on the metaphors for organelles and what they do that we encounter on the way. I just want to stress however that this article tells a very typical story about how science is often ‘done’ (it all starts with “I thought I’d made a big mistake” p. 162). It is also a typical example of how science is communicated: using well-established metaphors, extracting metaphors from scientists who use the ones they always use or create new ones on the spot, and giving that mix some creative twirls. Now we come back to the dance metaphor, because one scientist interviewed for this article uses it as an extended metaphor to tell a whole new story about organelles. I have now dissected this great article in terms of the metaphors it uses. 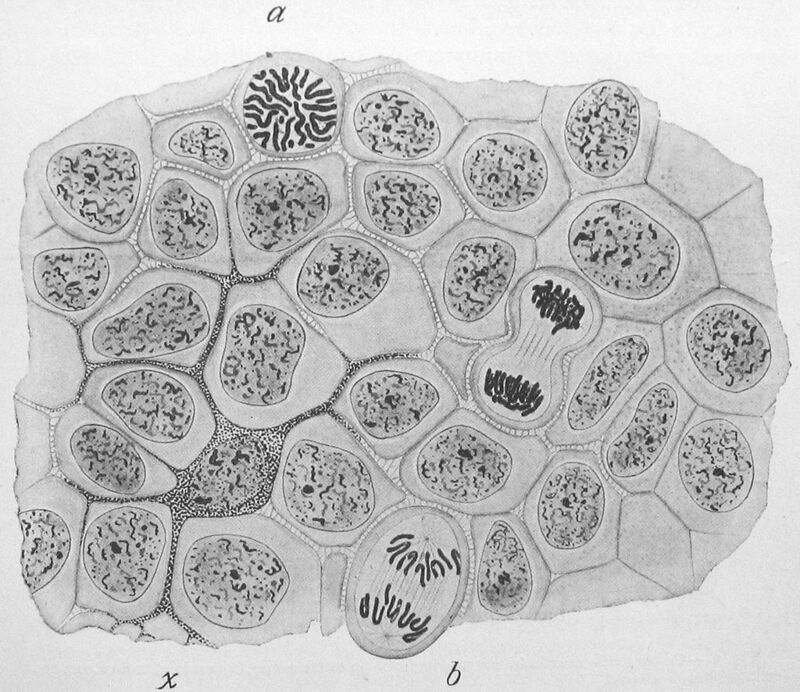 While doing so, it became clear that focusing on the verbal is not enough and that images and visual metaphors also play an important role in doing organelle science and communicating organelle science, from the end of the 19th century onward. The article itself contains a wonderful little cartoon of dancing organelles but also a (I believe) video still of the Endoplasmic Reticulum ‘swapping goods with various organelles’. Images changed from drawings to traditional microscope images to “super-resolution light microscopy to capture kaleidoscopic-colour 3D movies of intricate interactions between six organelles: the ER, mitochondria, the Golgi complex, peroxisomes, lysosomes and fat deposits called lipid droplets” (p. 164). Some researchers made “black-and-white films that showed the ER ensnaring mitochondria and other organelles in mouse neurons” (p. 164). Here we see a nice coming-together of verbal and visual metaphors. Do we also need to update the language? It seems to work quite well at the moment, I think.